TORONTO, ON Nov 25, 2013 – The National Crowdfunding Association of Canada (NCFA Canada) today announced that Jeremy Bernard, Founder and Owner of Legend Marketing, has joined the Association’s Crowdfunding Ambassadors Program. Jeremy Bernard, Founder and Owner of Legend Marketing, serves as a strategic advisor to small businesses, technology startups and national sports organizations. His areas of expertise include strategy, communications and online marketing. Jeremy has an MBA from Saint Mary's University and resides in Canmore, Alberta. "As an entrepreneur, I understand how hard it can be to raise risk capital outside of friends and family. With crowdfunding, I see a real opportunity for inventors, artists and others to not only raise funds but to build an important base of early adopters and advocates on an international scale. 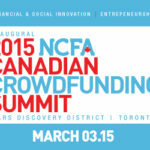 As an NCFA Ambassador, I look forward to helping entrepreneurs explore crowdfunding as a path to success". – Jeremy Bernard, Founder and Owner, Legend Marketing. Jeremy is a strong advocate for crowdfunding, having delivered presentations on the topic to several organizations. He has also worked with entrepreneurs to assess crowdfunding suitability and readiness. We look forward to Jeremy’s contributions to our expanding Ambassadors program.” -- Craig Asano, Founder and Executive Director, NCFA Canada. Legend Marketing provides strategic planning, communications and online marketing services to small businesses, technology startups and a wide range of other organizations. The company also delivers presentations, workshops and training on marketing topics, including crowdfunding. By putting strategy first, Legend Marketing delivers measurable results for its clients. For more information, visit www.legendmarketing.ca.